A new adaptation ignores the realities of Jim Crow America in favor of spreading its message of love. Through 4/15: Wed-Thu 7:30 PM, Fri 8 PM, Sat 3 and 8 PM, Sun 2:30 and 7:30 PM, Court Theatre, 5535 S. Ellis, 773-753-4472, courttheatre.org, $50-$68, $45-$63 seniors, $37.50-$51 students. Editor's note: During the play, one of the characters uses a racial slur. Although the offensive language came directly from the script, we should have not printed it. We have removed the offensive word. We apologize. The author has written a statement. N early everything's in place in Court Theatre's digestible Guess Who's Coming to Dinner, Todd Kreidler's unnecessary stage adaptation of William Rose's Oscar-winning 1967 screenplay. As in the film, the well-heeled Drayton family, led by progressive newspaper publisher Matt and liberal art dealer Christina, get impromptu implicit bias training when their headstrong daughter Joanna arrives unannounced with the fiance they've never met: John Prentice, a world-renowned research doctor who's— gasp—black. When Prentice's parents show up and discover their star son is ready to throw his life away by marrying unwisely, all manner of hell—by which I mean all manner of artfully arranged prickly conversations—breaks loose. Kreidler adds some superfluous plot points (Joanna's now got a brother who died 15 years ago, Christina's expecting a rich art patron who never arrives) and a couple of overworked metaphors (a blooming cactus, a telling children's song). But mostly he elaborates on the film's basic structure: a series of orchestrated parlor conversations and set speeches that lead almost everyone into the right-thinking light. But one key thing is missing: the world beyond the Drayton home. While the insidious strictures of Jim Crow America give the stodgy film a malevolent edge, they're rarely palpable here. Part of the problem comes from the script's emotional forwardness, a stark contrast to the film's patrician rigidity. People here are largely incautious, rarely holding cards close to the vest but instead letting loose with little provocation, often when the room is full of people (in the film, characters are routinely tucked away in pairs, as though the whole affair is too volatile to discuss even semipublicly). 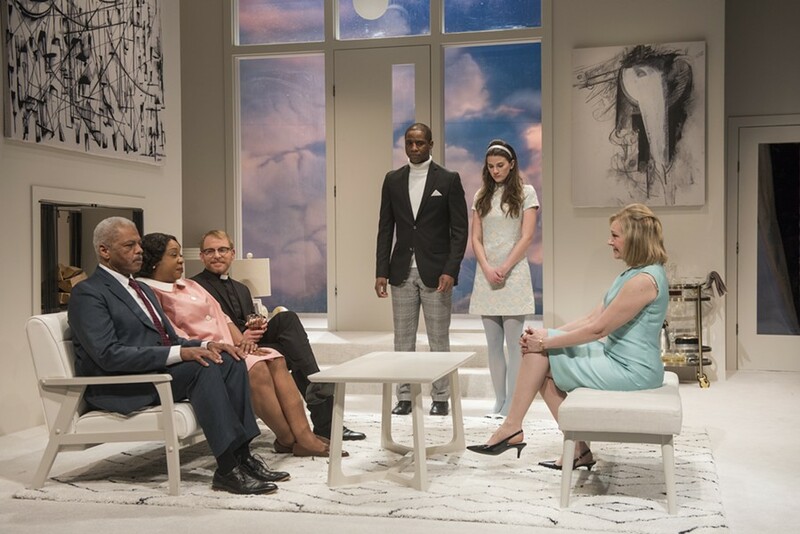 Everything onstage feels more fleshed out and humanized than onscreen, an impulse that director Marti Lyons's solid cast exploit convincingly if transparently. It just never feels like 1967. Or rather, not until Mr. Prentice's pointed outburst late in act two, during which he paints for his son a horrifying picture of the life he'll face. At best, white America will take credit for his research. At worst, it will leave him with a cracked skull, tormented children, and he tells his son, a wife who'll "wake up one morning and call you a [vile racial epithet]." It's an extraordinary moment, when monstrous social forces finally crash the dinner party and threaten to crush everyone.